We also saw the doctor today and he was quite impressed with Ainsley's weight gain. When we left the hospital a week ago, she weighed 6 lbs 13 ozs. Friday she was down to 6 lbs 8.5ozs. The doctor and lactation consultant were both mildly concerned about the loss, so we scheduled more appointments for follow up this week. It seems that my milk just needed a few days to catch up with Ainsley's appetite. On Tuesday she was up to 7 lbs 3.5 ozs and today she surpassed her birth weight (which babies are expected to be back to by 2 weeks) at 7 lbs 8.5 ozs! Everyone is so impressed with her. This is really great news for all of us since we were a little worried. She's a cutie, Sarah! I'm so happy for you guys! this is more of a comment on the whole blog, especially the pics. AMAZING!!! She is wonderful. Congrats to both of you--hope to see all THREE of you soon. 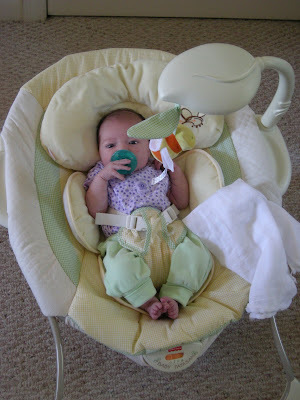 It's normal for babies to drop weight a little at first. Sounds like she's doing just fine. I'm having fun reading of your adventure. Babies really are quite amazing and wonderful.